When we last looked, the evidence indicated the Philadelphia sugary drink tax had problems. Now a new paper finds even more was wrong. Targeting a vast array of sugar sweetened and artificially sweetened drinks, the Philadelphia sugary drink tax affected most of the beverage aisle. The price of a 2-liter bottle of Coke, for example, went up a whopping two-thirds–from approximately $1.56 to $2.57. The Philadelphia tax kicked in on January 1, 2017. According to the mayor’s office, its main goal was revenue. However, as a 1.5 cents an ounce tax on distributors, consumers felt the bite when it passed through. Thinking of its revenue goal, the tax fell short. The estimate for the first year was $92 million. At $79 million, they missed their target in 2017. As for consumption, demand dropped in Philadelphia by 46%. However, when we look at the cross shopping outside the city, its decrease, at 22%, was actually much less. Researchers concluded that the tax had a negligible nutrition impact. Consumers weren’t substituting real juices and waters for the higher priced soda. They even found evidence that low income consumers with a greater incidence of obesity responded the least to the tax. Called the law of demand, when price rises we are willing and able to buy less. When price falls, we could decide to buy more. Here though is where an imaginary rubber band enters the picture. If a price hike creates a big decrease in what we are willing and able to buy, then our demand is elastic. When a relatively large price hike barely diminishes what we are willing and able to purchase, then our demand is called inelastic. For both we can imagine a rubber band that either stretches a lot with elastic demand or a little when it is inelastic. You can see how elasticity and a sugary drink tax relate. If our demand is elastic, our purchases will plunge because of a tax. 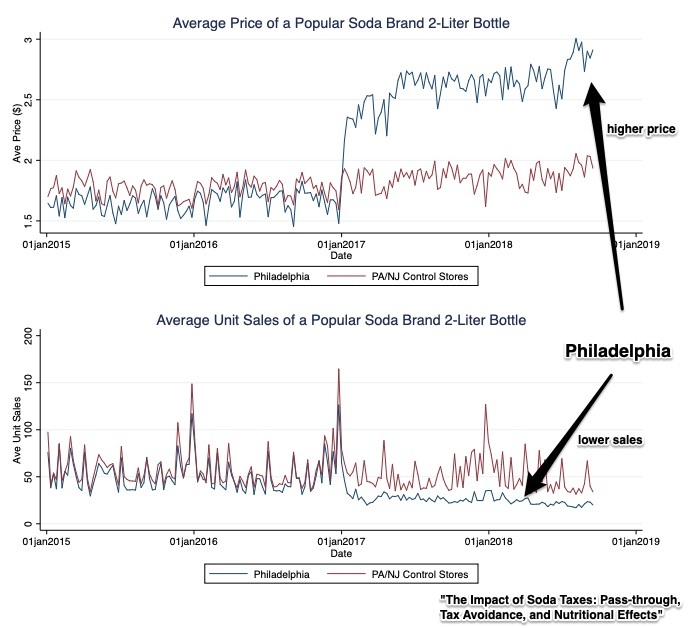 With the Philadelphia soda tax, people’s ability to cross shop and their preferences for sugary drinks appears to have all of the characteristics of inelastic demand. My sources and more: Presenting the perfect summary, WSJ led me to the new paper on the Philadelphia soda tax. And, this was the earlier 2018 study that cited some problems.